Watertown Plastics Inc.'s. comprehensive quality program ensures commitment to meet the highest quality standards required by our customers. Our quality department is staffed with qualified quality personnel on all three (3) shifts assuring quality requirements are met at all times. Advanced quality planning is critical in achieving the highest quality standards and we encourage our customers to participate with it in our quality planning. Our quality system is compliant with ISO 9002 requirements as well as Automotive, Medical and Cosmetics Industries. Our quality system has allowed us to achieve approved supplier status with out customer, many who are among the Fortune 1000. At Watertown Plastics Inc. we achieve quality requirements by performing inspection at different stages of the production cycle. Start-up / first piece inspection to approve product for production, in-process to verify quality requirements are being met and final inspection before shipping to the customer. A heavy emphasis is placed on our in-process inspection system, allowing us to minimize defects. Watertown Plastics Inc.'s. employees understand their responsibilities for a quality product and are continually trained in strategic areas such as Statistical Process Control (SPC), and Metrology. 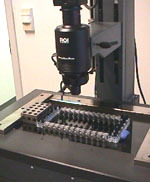 The Ram Optical Video System is a fully automatic measuring system. When programmed this system will measure automatically, significantly decreasing the amount of time to measure a part, allowing for more frequent inspections.